You may struggle to get hold of the 2SC828 transistors, so just try any high gain NPN silicon. Just make sure the pinouts match, or use some small heatshrink tubing or offcuts of wire insulation and twist the legs if you need to. are you sure this layout works? i cannot get any sound through my finished vero. When i unplug the power wire i get a weak dry guitar signal. Just swapped that 5K pot with 2K, and it made a huge difference. 5K really starves the trem and it doesn't come back untill you turn the pot all the way clockwise. With 2K the slowest possible settings are gone, but now it doesn't starve to death :) Something like 3K5 pot would probably be best. Don't think those exist though. 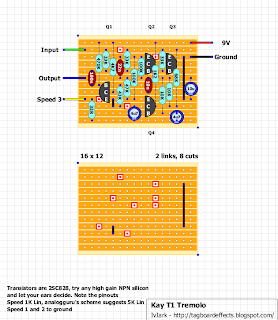 If someone wants the range to be slower, one could add 1-2K resistor in series with speed 3 lug - before the 2K pot. Nice little trem, and really fits in 1290A with little patience. Thanks again for this one Mark! if i get it up and runnin' i'll let ya know. What value pot did you use? 5K killed the tremolo on mine. 2K worked well..
swapped in a different 5k, and it works now. pretty big volume drop though, not sure if i'm a fan of this one. thanks! I think there may be a typo with the layout. All of the schematics I found online showed a 220n cap at the output, not 22n. May just be a typo. I first tried 2N5088 and 2N3904 transistors, but they caused the signal to overdrive quite a bit, especially when I would play chords. After some reading online, I replaced Q1 with BC109B (and kept Q2-Q4 as 2N3904). This helped keep the signal nice and clean, though the volume dropped. I increased the 47k at the output to 150k and that took care of the volume issue. Now it's boosted just slightly. The signal still isn't as clean as when the effect is bypassed, but it's good enough for me. I should also note that I used the popular depth mod. It was easy to add to this layout. Mine is overdriving pretty terribly... I tried mpsa42's and i didnt get any tremolo. I then tried some 380hfe bc184l's those gave me trem but also distorted the signal quite a bit. Running it with my drone synth made the oscillators sound wayyyyy different. I tried using a bc184 in Q1 then mpsa42's in q2-q4 but that gave me less distort but also less tremolo. I dont have a bc108b like bryant mentions above. i tried building the repeat percussion to get this effect, but i had the same problem as many others and it didnt have enough depth or was getting dry bleed through- definitely not percussive. 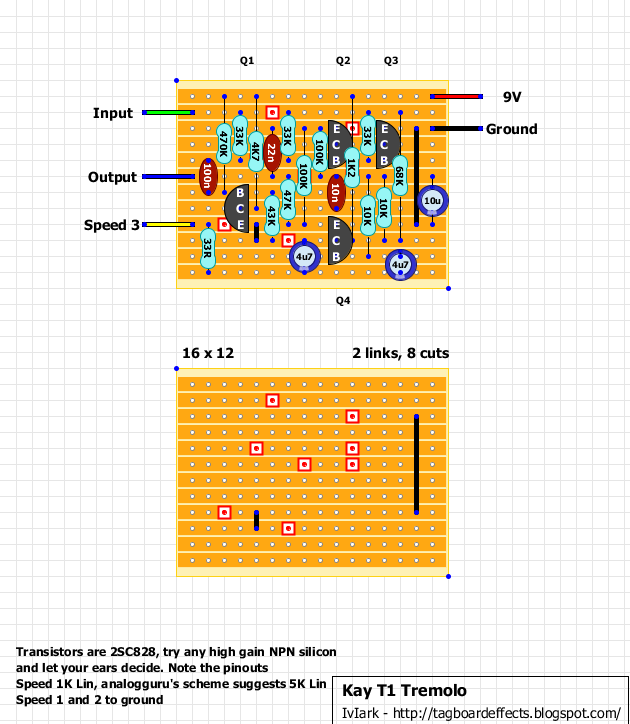 anyone have transistor recommendations for this circuit? it would be much appreciated as I have built like 5 boards recently that all work but are just falling short in terms of sounding how they're supposed to sound. So i'm getting pretty frustrated. I need help with the jen hf ring mod, the repeat percussion, this kay tremolo, the harmonic percolator, the ghost echo from sabrotone. man...! The MPSA42 is a very low gain transistor, and this recommends high gain. Also it has a CBE pinout, did you twist the pins over? Hey guys, figured I'd share my experience, having built this circuit tonight. My transistor selection was limited, so I ended up with an MPSA42 in the first spot, 2N5088s for the twin Ts and a 2N3904 at the end. Best combo I could find in terms of chop and low distortion. I also put in a 5K trimmer in place of the 33R resistor to lug 3, so I could fiddle with the pot range. Sounds great to my ears now! It's got just enough grit to sound warm and far from sterile. Thanks for the layout. Hey fellows, i built this trem a while ago, but put it off for some time, because it didn´t work. I´m only getting a slightly weaker guitar signal, but no tremolo effect (+some hiss). I´ve used 2n5087s and a 2KB pot. Thanks for this great website btw!